Our Artists-in-Residence program celebrates the commitment these authors and illustrators have made to the field of children’s literature. Our 2017 Artists-in-Residency include Laurie Halse Anderson, Kathryn Erskine, Denise Fleming, Matt de la Peña and Varian Johnson. Each artist-in-residence will spend five days at the Highlights Foundation Retreat Center working on projects for publication. To raise awareness about these artists and their upcoming works, we invite other artists – writers, poets, and illustrators – to join them during their residency. While days will be spent on individual projects, mealtimes will bring all artists together to share farm-fresh food and conversation. After dinner, our artists-in-residence will host informal sharing and feedback sessions for all works-in-progress. 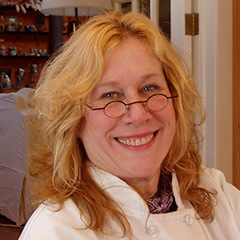 Denise is the author/illustrator of many award-winning picture books. 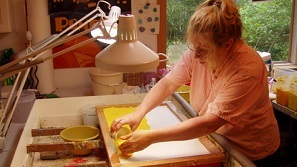 Fleming’s books are created in her signature style of pulp painting—a paper making technique. Often the art is embellished with decorative papers, pastels, or copy transfer. 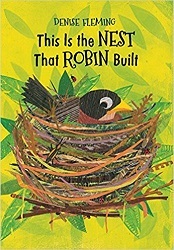 Her work has received many awards, including a Boston Globe Hornbook honor, a Caldecott Honor, and the Silver Medal at the Society of Illustrators. Her books have been included on many best book lists and master lists, such as Chicago Public Library Best of the Best and CCBC Choices, along with the Oppenheimer Gold medal, among others. Her most recent book is Go, Shapes, Go! Begins on Sunday, October 1 and ends on Thursday, October 5, with lunch, followed by an optional tour of Highlights for Children and Boyds Mills Press.